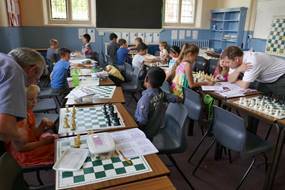 The Concept: in line with the Hull and District Chess Association Junior strategy, to hold a three-day summer school, with the objective of promoting and teaching chess to children of all abilities. To closely link in with local schools and clubs. In outline: there were to be three groups, ‘beginners’, ‘intermediate’ and ‘advanced’. Using ECF Accredited coaches, the programme should be ‘bespoke’ and be capable of development and repeating in future years. Advice was given by Traci Whitfield, ECF Director of Junior Chess and Education. Group 1 Advanced: Led by Charlie Storey. Development programme for players who already have a grade and play in a team/league. Maximum 10/12 children – mixed ages. CS developed a two day programme, taking into account requests from individuals, able to be repeated/developed at a later stage. Group 2 Intermediate: Led by Noel Stewart, YCA Secretary. Three days. Principally players in a school club, but with either a low grade (under 100) or with no team experience. Maximum 15/20. Target age group primary. Group Three Beginners: Led by Dan Staples, Chess in Schools and the Community (CSC). A condensed, three day version, including workbooks, as a part of their normal programme. Maximum 15/20. Target age group primary. For group one, known players were targeted from both Hull and elsewhere in Yorkshire. It was also advertised in the British Chess championship programme. For groups two and three all primary schools from Hull and those within a 15 mile radius of the venue in East Yorkshire were sent information about the summer school by way of a poster (below) and a specimen letter, with further details to go to parents. The poster was also displayed in all local libraries. Following acceptance onto the programme a further, more detailed letter was sent, together with a consent form covering various practical arrangements as well as Child Protection issues. An outline programme was also sent to each parents and students. Summer School practical arrangements: The summer school was held at Hymers College, who gave all their facilities free. A classroom for each of the groups, plus one for parents. The classrooms were adjacent to the main hall also available for play. Immediately adjacent were the school playing fields, ideal for lunch breaks. Ample parking available. Each day was broken up into three sessions, between 10.00 and 15.00, with a drinks and snacks break in between. Drinks and a variety of snacks were provided free of charge to the children and hot drinks and biscuits were available all day to parents. Apart from Hull and District there were children from Brigg, Caistor, Harrogate, Newcastle, Leeds, Scunthorpe, Southend on Sea and Wakefield. Following successful completion of the programme each child received a certificate of achievement, signed by the tutor, a medal and a Hull British Championship badge. Outcome: The summer school was judged to be a great success-one of the best things we have ever done. 33 children received 12 hours of chess coaching-19 were complete beginners. 12 children in group one received 8 hours of coaching. Feedback for each group has been universally positive (see below). We now need to follow-up on this success. Each participant received details of local clubs, our Saturday morning library classes and the Junior Club at Hull Chess Club. Our junior officer will follow-up with each school-for those with no current chess club reminding them that we provide small grants to help set-up clubs. Plus we will use the summer school as a platform to encourage more schools to get involved in events like the Delancey Challenge. Lessons: There was one safeguarding issue. We required a register to be taken twice a day, but did not ask parents to sign their children in or out. One parent took their child out at lunchtime and was late coming back-we were not sure where they were and the emergency telephone number was not with the register. The Future: Follow-up is obviously critical so we don’t lose the momentum created by the summer school. Funding permitting, this is certainly an event we should run again-we have a ready-made intermediate group from this year’s beginners group and some of the intermediate might be ready for the advanced group by next year. We need to ensure we get as many of the children to come to our schools day and entering the Hull junior congress. Costs: The total cost of the summer school was £2,340. Of this £2,100 were staffing costs and expenses (including preparation, travel and overnight accommodation), £140 for refreshments and £100 for medals and badges. Hymers kindly provided the use of their facilities for free (inc. urns of hot water and assistance from the on-site caretaker) and all local chess players freely gave their time. Coaching and refreshments were all provided free of charge to children and parents. This would not have been possible without the grant from the John Robinson Youth Chess Trust. • With immense pleasure and satisfaction i would like to congratulate you on this marvellous effort. These 3 days has been very useful and beneficial for my son and hope all other kids had a great time as well. I must request you to do every possible effort which i am sure you will to make such event more frequent during school holidays and within school terms as this gives kids great opportunity to learn a new skill along with its social benefit as well. • Joshua and Jayden enjoyed it very much. When i enrolled them for the summer school, it was an attempt to see if playing with similar aged children would spark an interest. Joshua has always been able to play a little, but put an iPad in front of him he would always pick that, Jayden never really had an interest beyond a couple of moves. so i was over the moon on the first day when jayden said he couldn’t wait to return for the second day, job done! We played at home after the chess school and again in the morning! this might just catch on! • I just wanted to say thank you for a great an enjoyable three days for the children. Guy & Keira are new to Chess, so we didn't know how the summer school would go down. They both really enjoyed the course - in fact Keira said that for her birthday next week, more than anything she wanted a Chess set. That's a result! • Hi thank you for providing this , Ruby loved it! I’ve Already emailed the head of Brough school to start a chess club , I’m sure Ruby will be pushing for this as it focussed her mind with her having adhd . • My daughter, Elsie, really loved this event. We would definitely do it again. Only a few things were too easy for her. Thank you so much! • Chahna fully enjoyed the summer school, her words "i loved it and it was a great experience". Never playing chess before on completion of the three days Chahna is constantly playing board and online! She has asked if there is any other classes she can attend on a regular basis. I personally thought it was brilliant for the children who attended and organisers went above and beyond to provide drinks and also snacks multiple times a day! I think it is a fantastic opportunity for children to use and expand their minds throughout the holidays. • My two daughters thoroughly enjoyed learning how to play chess, and have been trying to teach me since they finished! They have already said they’d happily do it again. Thanks once again for the summer school, and the opportunity afforded to the children. • I would like to thank and compliment you and all your team on such a great Summer School. It certainly did not appear as though this was the first one you’d attempted. I thought it seemed highly organised, and pre-registration/final instructions were all efficient and comprehensive. The location seemed to work well at Hymers for the main hall and classrooms etc., and the added opportunity for the children to get outside on the field at lunchtime. I did not need to stay, but the provision of a room for parents too was a great idea. My daughter was a complete beginner, and so honestly I was unsure how she’d go, or whether she’d really enjoy it. But even after day one she was enthused. She thoroughly enjoyed it and has already been spotting chess sets and tells me she’d like to join a club! If you’re able to do a repeat next year then I believe she’ll definitely want to attend again. • Thank you so much for providing my son with the chess coaching this week. He thoroughly enjoyed the whole three days. He has been really ‘buzzing’ and keen to show us all that he has learnt. There isn’t currently a chess club at his school and he would like to talk to his headteacher about starting one. Could I suggest the school gets in touch with you regarding any possible support?